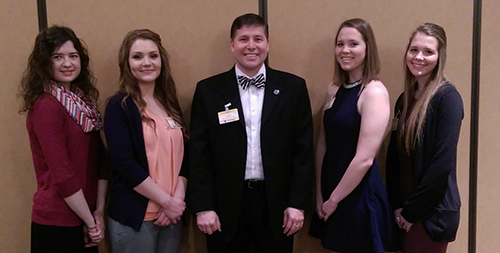 Top community college scholars from the state of Kansas, including four from Cowley College, were honored Thursday, February 11 in Topeka at the annual Phi Theta Kappa Honor’s Luncheon. Representing Cowley were Samantha Twenhafel and Hannah Twenhafel from the Arkansas City campus, and Taylor Swarts and Tabitha Slater from the Mulvane Center. Each student went through a rigorous application process in order to be selected by the committee to represent Cowley College on the All-Kansas Academic Team. The students were judged on their academic achievement, leadership qualities and service work. Each is also a nominee for the 2016 All-USA Academic Team, sponsored by USA Today, Phi Theta Kappa and the American Association of Community Colleges. Fellow PTK sponsors Scott Layton and Tiffany Corley attended the luncheon as did Cowley President Dr. Dennis C. Rittle, Executive Director of Student Affairs Jason O’Toole, and Board of Trustees member Bob Juden. Students met several state representatives during the luncheon and were presented with medals. In addition, the members of the 2016 All-Kansas Academic Team, sponsored by Phi Theta Kappa, the Kansas Association of Community College Trustees and the Kansas Council of Community College Presidents each received $300 for their continued excellence. Phi Theta Kappa is a nationally recognized honor society for students attending community colleges.